Avoid Jail if you are an illegal immigrant. An INS hold may be placed on you, which could lead to deportation. Local law enforcement agencies are working with federal immigration officials to screen all persons who come into local jails to determine if they are in the United States illegally. As of November 30, 2007 it was reported that INS officials working with local jail employees have identified 4,152 inmates suspected of immigration violations. These inmates are having INS holds placed upon them and deportation proceedings are being held, which will lead to many of them being deported. One the best things that can be done for an inmate who has been arrested is to work with a law firm to attempt to have the accused released from custody before the INS places a hold on the person. In most cases, it is extremely difficult to have an INS hold lifted. So having your loved one released from custody prior to the INS hold being placed should be your highest priority. 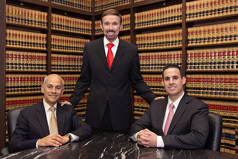 Feel free to contact Wallin and Klarich 24/7 to discuss your legal matter. We will be there when you call.